PerryGolf is proud to partner with Azamara Club Cruises for this exceptional 10 night, 4 round golf voyage to some of the most beautiful ports in South Africa onboard the outstanding 690 guest Azamara Quest. 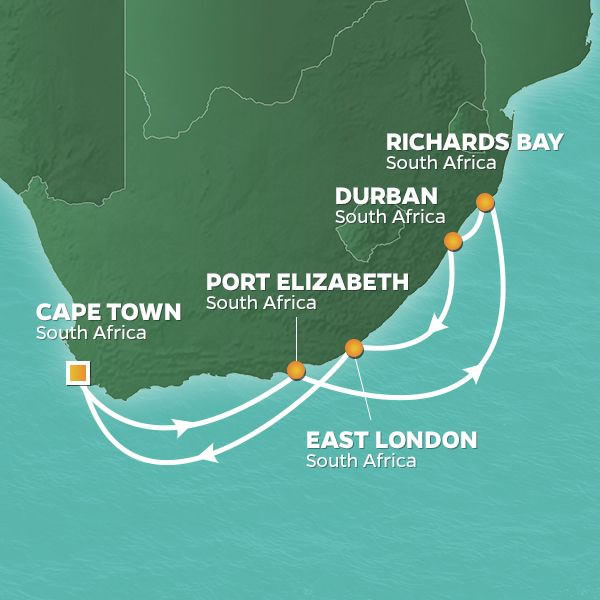 We begin in Cape Town with four captivating ports of call ahead including Port Elizabeth, Richards Bay, Durban, East London and finally, a return to Cape Town. The golf lineup includes four rounds at the highly rated courses of Humewood, Durban and Pearl Valley. ... Read More. Explore the diverse and cosmopolitan city of Cape Town, visiting its many iconic attractions, including the Table Mountain Aerial Cableway. Enjoy the beautiful beaches of Port Elizabeth and the Addo Elephant National Park, which is the only location in the world that’s home to each of Africa’s “Big 7” animals. The golf is equally diverse. Durban has been a regular host of the South Africa Open and is a links style layout offering panoramic views of the Indian Ocean. The Jack Nicklaus Signature Course Pearl Valley is set in the famous Franschhoek Wine region, and is a treat to play. We also offer exceptional pre and post-cruise opportunities; In advance of the cruise join us to fly directly into the magnificent Kruger National Park to experience safari at its absolute finest, with accommodations at the fabled Jock Safari Lodge. We also play South Africa’s #2 rated course Leopard Creek set on the southern boundary of the park. Following the cruise we fly to George to stay at the world renowned Fancourt with golf on both courses, The Links at Fancourt and Montagu, plus the equally dramatic Pinnacle Point. As with our golf cruise the pre and post-cruise packages are highly amenity inclusive. Every aspect of the golf program is managed by PerryGolf staff onboard and ashore. Your clubs will be waiting your arrival at the golf course. Tee times and pairings will be posted the night before. Casual competitions will be arranged and prizes awarded. Lunch is included while you play plus there will be an open bar at the clubhouse when you finish. Carts/caddies, transfers, local taxes, service charges and gratuities (excluding caddies) are included. The guest list will number between 40 and 60, most of whom are golf couples although it’s common to have non-golfers who will enjoy themselves as a luxury cruise guest starting with Quest’s fabulous facilities along with a wide selection of Azamara Shore Excursions®. The “2020 South African Golf Cruise” is a full-featured vacation and a unique opportunity to enjoy a yourself in the company of like-minded new friends! Cape Town is home to many iconic attractions beginning with the Table Mountain Aerial Cableway. More than 25 million people have taken the 4-5 minute ride to the summit since the cableway was opened in 1929. In 1997, “Rotair" cars were installed with floors that rotate 360 degrees providing passengers a panoramic view. Enjoy Cape Town on your own or via Azamara Shore Excursions®. GOLF: Humewood Golf Club was considered the top course in South Africa by the legendary countryman, professional Bobby Locke during his prime in the 1930s and 40s. A genuine seaside links, Humewood has played host to the South African Open and South African Amateur on many occasions and Ernie Els is a past champion of the Goodyear Classic, held at the course from 1984-1992. The greens were converted to bent grass in 2009 and the result was consistently magnificent putting surfaces. SIGHTSEEING: Port Elizabeth is known for its supreme natural beauty, specifically the pristine beaches and vast areas for unsurpassed game watching. Take a stroll and enjoy the views from the stunning Storms River Bridge. 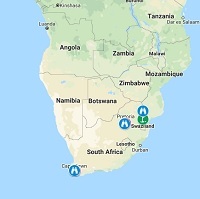 Visit the Seaview Lion Park or make a trip to the Addo National Elephant Park, which is the only place in the world that’s home to each of Africa’s Big 7 - lion, buffalo, leopard, the endangered black rhino, elephant, Great White Shark and Southern Right Whale. Enjoy Port Elizabeth on your own or via Azamara Shore Excursions®. Richards Bay, named for the British Naval Commander who landed troops on the Zululand coast in 1879, is one of South Africa’s largest harbors and home to the world’s largest export coal terminal. The multitude of specialized ships that dock and depart here are a certain point of interest for any maritime enthusiasts. The sandy shores of Alkanstrand Beach provide a lovely, relaxing place to spend a morning or afternoon. Hippos, crocodiles and more than 300 species of native birds can be observed at the Tuzigazi Waterfront, an idyllic nature conservation area located at the confluence of the Mzingazi River and Lake Mzingazi. Golfers disembark in Richards Bay (along with any accompanying PerryGolf non-golfing guests who wish to participate - reduced rate charge applies) for an easy two round, one night off ship excursion including dinner and drinks plus overnight stay with breakfast at the beautiful Fairmont Zimbali Resort. The group will rejoin Azamara Quest in the late afternoon in Durban on the second day. Light lunches are also included along with normal golf program amenities. We make a scenic 90 minute morning drive south to Fairmont Zimbali. Light lunch on arrival. Afternoon golf at Zimbali Country Club. GOLF: Zimbali Country Club offers irresistible ocean and forest views, exceptional water and wetland features within an inspiring natural setting, and has developed the reputation of a memorable course with charisma and challenge. With the agenda of "conservation takes precedence," international golf course designer and former British and South African PGA champion, Tom Weiskopf crafted a course with dramatic elevation changes, varying eco-systems, which is ecologically sound while maximizing the natural landscape. Enjoy Richards Bay on your own or via Azamara Shore Excursions®. This evening all overland guests enjoy an included dinner at Fairmont Zimbali. Short morning drive from Fairmont Zimbali to Durban Country Club. GOLF: Durban Country Club combines lush vegetation, sand dunes and gorgeous views of the Indian Ocean and is a typical links layout with wide, undulating fairways. As a regular host for the South African Open as well as the Volvo Open in 2013 and 2014, the course measures 6,400 yards and plays to a par 70 from the club tees. The par-5 5th will seize your attention due to the elevated tee, gusting wind and ocean view. Non-Golfing guests who participate on our overland program may visit Durban Country Club with the golfers in the morning, and then return to Azamara Quest for lunchtime, to then enjoy any of the Azamara Shore Excursions® on offer in Durban in the afternoon. SIGHTSEEING: Durban is a diverse and interesting city to explore. Ride on horseback down The Golden Mile, the city’s beachfront, which features clean sand and the clear beautiful water of the Indian Ocean. Shop at the Victoria Street Market, which opened in 1870 and has the feel of a city which is home to the largest Indian population outside of India in the world. Tour the Moses Mabhida Stadium, one of the host sites for the 2010 World Cup, and open to the public on non-game days. Take a ride through the vibrant city streets on a colorfully decorated rickshaw, which is a preferred mode of transportation, into Central Durban and sample the array of dining and nightlife options, including the sparkling Suncoast casino. Enjoy Durban on your own or via Azamara Shore Excursions®. East London is a relatively small town on the eastern Cape. Stroll the sands of Bonza Bay Beach or Cove Rock. The East London Zoo is located inside the beautiful Queens Park Zoological Gardens and is home to an impressive variety of plant life and animals, including tigers, jaguar and chimpanzee. East London has numerous superb dining options, downtown and along the waterfront, including Arthur’s Restaurant & Pub, which is famous for its menu selections as well as supreme hospitality. Enjoy East London on your own or via Azamara Shore Excursions®. Cape Town is a iconic and cosmopolitan city, its waterfront area once described as a combination of San Diego and the inner Baltimore harbour on steroids. Walk through the Company Gardens, the fresh produce gardens for ships and locals from the mid 17th Century and today. Downtown you’ll find the SA Museum, Cultural History Museum, Houses of Parliament, National Gallery and St George’s Cathedral. Head through the city to Greenmarket Square to browse African mementos at its bustling market stalls. Drive to the Castle of Good Hope, the oldest building in South Africa with its collection of Old Cape paintings and take in the Grand Parade where Nelson Mandela addressed the nation on his release in 1990. Move on to the District Six Museum to view a moving collection of stories, pictures and memorabilia highlighting the colorful life of this suburb which now stands empty, thanks to the destruction of homes and forced removal of residents during the height of the Apartheid era. GOLF: Pearl Valley, set in the famous Franschhoek Wine region, is a Jack Nicklaus Signature Course and a treat to play. Pearl Valley is considered one of the top conditioned courses. As with many Nicklaus courses, water on the right with plenty of sand, will keep the golfers minds off the wide landing areas provided. The course and its geographical location allow for guests to enjoy a day outing in the Winelands with high quality golf to compliment the food and wine. SIGHTSEEING: Continue to explore Cape Town at your leisure today, perhaps making the short trip to the Cape of Good Hope, enjoying lunch and a tour of the lighthouse located at the rocky promontory on the southern tip of the peninsula. Overnight: In Port – Cape Town, South Africa. Arrive in Johannesburg this morning, where our VIP team will greet and transfer you to our group meeting point within the adjacent InterContinental Hotel. Early this afternoon we make the short flight directly to Skukuza Airport located within Kruger National Park. Please note your golf clubs with be taken by road directly to Leopard Creek Golf Club, and your non-safari luggage will be shipped directly to Cape Town ready for the cruise. Costs of shipping are included in your precruise package. On arrival at Skukuza, you will be met by the lodge rangers, who will transfer you in open 4x4 safari vehicles to Jock Safari Lodge, your home for the next three days. There will be time for a quick freshen up and orientation before heading out on the late afternoon safari drive. OVERNIGHT: Jock Safari Lodge – Thatched suite with private plunge pool. Wake up for the morning game drive. Enjoy coffee and tea in the bush. A full breakfast is served upon your return from the game drive. Enjoy an interpretive bush walk. Enjoy a massage on the deck of your suite or relax at the pool. Enjoy high tea before evening game drive. The fires are lit in the boma for dinner under the African stars. Nongolfing guests follow the normal safari schedule today. Golfers travel one hour to the Southern border of the park for golf at Leopard Creek. There are often excellent game sightings on this journey. GOLF: Today play Leopard Creek. Situated near Malelane in the heart of Mpumalanga, on the southern border of the Kruger National Park, Leopard Creek presents a rare opportunity to play an outstanding bushveld golf course. The 360-hectare development is bordered to the north and the west by the picturesque Crocodile River and the Kruger National Park. Typical bushveld koppies overlook the course from the east, providing an ideal backdrop for a magnificent Gary Player designed course. The club is ranked #2 in South Africa. Cart and snacks included. Golfers return to Jock in time to join the nongolfing guests for the late afternoon safari activities. Enjoy a morning game drive and full breakfast before checking out and flying from Skukuza directly to Cape Town. Your golf equipment will be shipped separately to Port Elizabeth in readiness for your first game of golf at Humewood during the cruise. Mid-afternoon arrival into Cape Town and transfer to the Table Bay Hotel. Breakfast at leisure, with the morning free to explore the V&A Cape Town Waterfront before transferring to Azamara Quest for our South African Golf Cruise. Disembark Azamara Quest and transfer to Cape Town Airport for a late morning flight to George on the Garden Route. Short transfer to Fancourt where you can relax and enjoy the resort facilities. The 150-year-old original Manor House and National Monument set on the 613-hectare Fancourt Estate has been meticulously remodeled to create a boutique hotel that offers old-world, new-world and out of this world beauty and elegance. This evening a Welcome Dinner. GOLF: Today play The Links at Fancourt. Created from a previously flat piece of land, over 700,000 cubic metres of earth was moved to transform it into a typical Links style. The course presents undulating windswept terrain and dune-style landscape and is the only such course in South Africa. This is a walking course with caddies, and is ranked #1 in South Africa. Host course of the 2003 Presidents Cup, 2005 Women's World Cup and 2006 South African Open. Please note this is a walking golf course with caddies. SIGHTSEEING: Explore the Klein Karoo with its collection of mountain passes, ostrich farms and the Cango Cave Complex. GOLF: Pinnacle Point is set high above the Indian Ocean, providing sensational, breathtaking views of the crystal blue water from across the course, this is truly a magnificent and memorable design. In all seven holes run parallel to the ocean shore. The home hole is a fierce risk-reward par-5. SIGHTSEEING: Travel to Knysna and Plettenburg Bay to explore the heart of the Garden Route. Visit the Elephant Sanctuary, Monkey Land, The Knysna Lagoon and Waterfront for some local craft shopping. SIGHTSEEING: Free day to enjoy the facilities at Fancourt or add personal touring through the hotel travel desk. 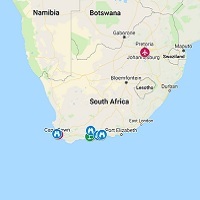 Our tour concludes today, and guests are free to make their own homeward travel plans, with George being the most convenient departure airport to connect to Cape Town or Johannesburg for onward international flights. Enamored with the Old Course at St. Andrews, the architect Colonel S.V. Hotchkin set out to emulate the links layout when hired in 1929 to design Humewood. The Colonel put a twist on the familiar links of the British Isles, however, straying from the nine holes out, nine holes in routing and angling holes in every direction. This creates a fascinating experience atop the sand dunes of Algoa Bay, as golfers battle cross breezes, avoiding steep-faced bunkers and maneuvering along the firm turf. Designed by former British Open Champion, Tom Weiskopf. The course is both challenging and superbly beautiful, made more so by the proximity to the Indian Ocean. The course is spread over a large estate with dramatic elevation changes. Weiskopf did a tremendous job routing the holes through the jungle. There are several blind tee shots that could be unsettling to the first time visitor, however, Weiskopf ably allowed ample room in most fairways to enable the golfer to be in position to play the hole. In any golfer's books, Durban Country Club rates as one of the finest courses in the world, let alone Africa, or even South Africa. The course lies adjacent to the beach onto which the Indian Ocean gently pushes its waves, separated only by a freeway linking the Northern suburbs with the city. It has a merry mix of tall trees, thick bush, severe slopes, undulating fairways that sometimes resemble rolling waves, and some very clever tee positions, with the ever penalizing bunkers lying in wait. The Table Bay Hotel is a five-star, 329-room hotel and it uniquely responds to its magnificent surroundings. It has a maritime flavour that extends to each room and suite, which has sea or mountain views and is a luxurious port of call. The interior of the hotel presents a kaleidoscope of impressions, from the European marble mosaic of the entrance court to the intricate parquet floor of the foyer framed by the full-scale drama of Table Mountain, with the activity of the harbour in the foreground. Below the foyer to the south, is the grand lounge with its cathedral ceiling and twin fireplaces. The Table Bay is situated adjacent to the Victoria & Alfred Waterfront shopping and entertainment complex overlooking the Cape Town harbour and is five minutes from the city centre. A nearby dock, capable of accommodating an ocean liner, is at the threshold of the restaurant. The restaurant, has a private dining bay and Wine Cellar, and panoramic views of the mountain range and harbour. The hotel has a heated pool, well equipped gym and a health spa on site. All meals at Jock Safari Lodge. Game drives as specified. Shipping of golf clubs from Johannesburg to Leopard Creek Golf Club, and onwards to Port Elizabeth as first golf cruise stop. Shipping of cruise luggage from Johannesburg to Cape Town (limited luggage on Safari). Snack lunches at golf courses or on sightseeing tours where timings permit.